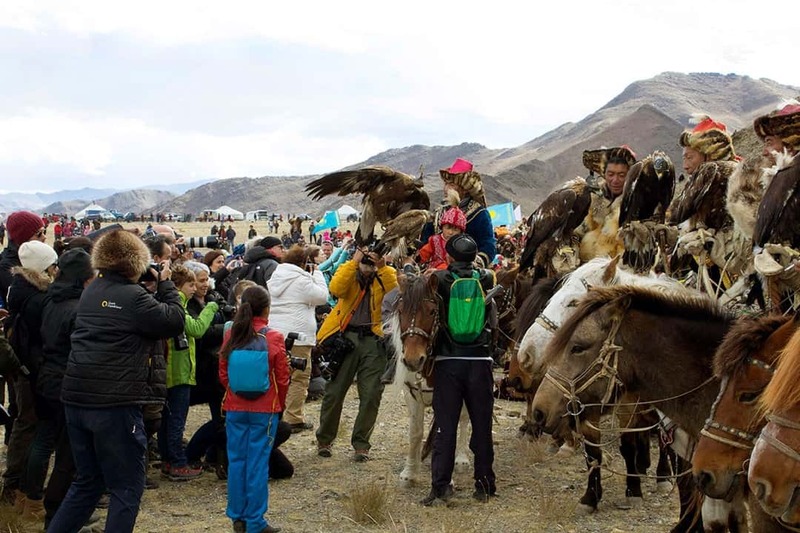 A first-timers guide to Mongolia’s Golden Eagle Festival. Hi! My name’s Kori. I’m an adventurous introvert and went to the Golden Eagle Festival in Olgii, Mongolia! Here’s some tips to help you survive and thrive on your trip. Although it is possible to travel Mongolia on your own, it is much easier with a tour as they can drive you across the tough terrain and arrange ger hosts for you. We used Travel Buddies who did an excellent job at arranging things and showing us around. All our guides were local and passionate about their country. 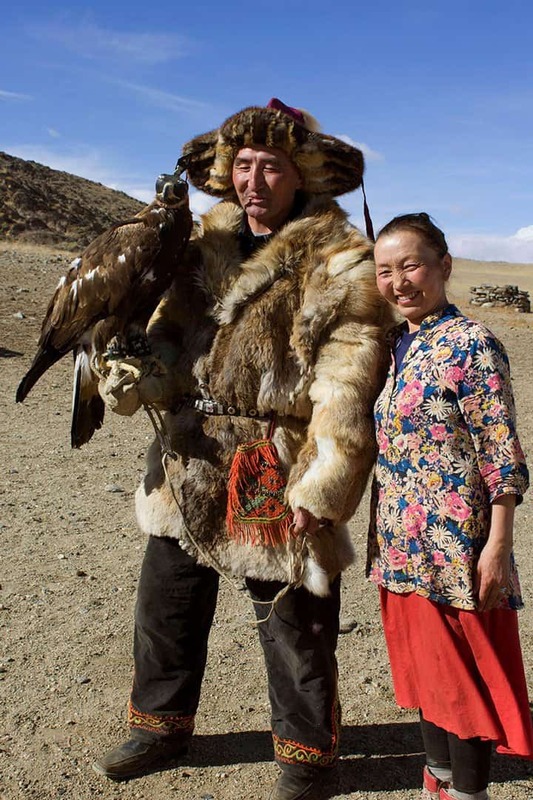 The cost per person including a few days in the Mongolian countryside, transportation, and the Golden Eagle Festival cost about $1200 USD. 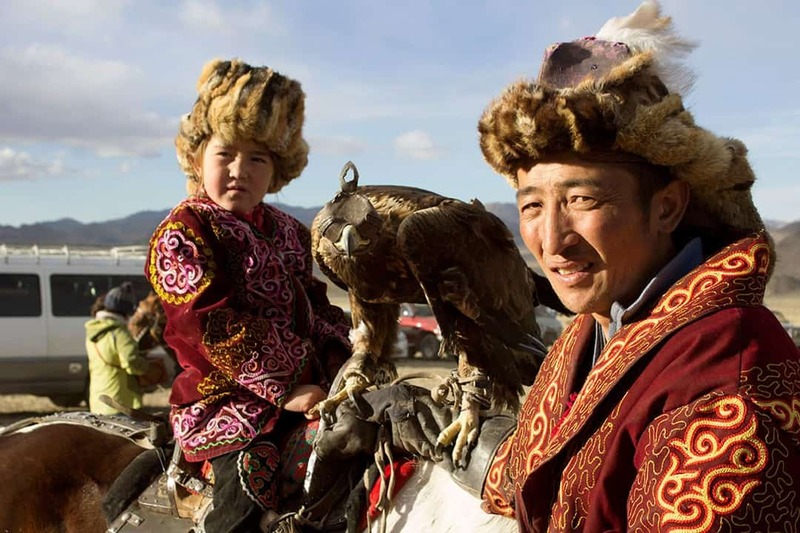 To get to the Golden Eagle Festival, you will have to take a flight through Ulaanbaatar which will take about 3 hours. You’ll land in a tiny airport in Olgii where you will not be allowed to exit until the waiting room is emptied of people waiting to get on the plane that just landed. When we exited the airport our new hosts, Aibek and Ainur, were waiting for us and brought us to our guesthouse. If you are travelling on your own to Olgii know that the hotels are very limited and even the local people say they are very bad. Originally we were supposed to stay at a guest ger camp in town but it filled up so our tour arranged for us to stay at a guesthouse. We were surprised that this literally meant being a guest in someone’s house! The couple who picked up us from the airport brought us to their home and showed us a spare room upstairs. Their English was limited but they were so friendly and welcoming it wasn’t a really a problem. Although our hosts had a nice home their bathroom had only a bathtub and sink. The toilet was still an outhouse out back, and a squatter at that. By this point I was used to squatter outhouses but those who are not should be warned that there are very few western toilets in Olgii! We were fed well and got to know their adorable young children as well. This gave us a very genuine experience and we left feeling like we made true friends. The Eagle Festival takes place in the first week of October. The weather from Beijing to Olgii was dramatically different, but still not terribly cold in town. However, where the festival takes place is in an open area that is very windy and if you do not dress properly you will be miserable. Dress in layers and be sure to have hat and gloves. Bring sunglasses even if it’s not sunny so your eyes can be protected from the blowing dust. Hand warmers are also a good idea. Bring plenty of tissue for the bathroom as well as the snotty nose you are bound to get. Do not expect a well-organised, strict-rules event. There are officiators, and a few security personnel but not nearly as much as you’d think. 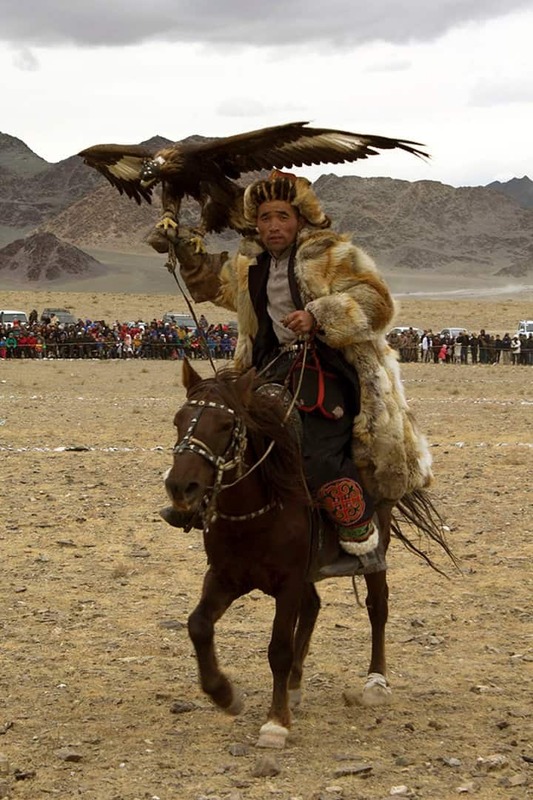 The festival began with announcing the hunters who would ride out on their horses one-by-one and show off their eagles. Then they line up at the end of the field and at this time everyone is allowed to approach the hunters for photos. This part was a little nuts. Many professional photographers as well as many wanna-be professionals swarmed the hunters and shot away. Some photographers were a little rude in my opinion, repositioning their targets without ever speaking to them. This is a great photographic opportunity but don’t forget that they are people too. It’s nice for everyone if you interact a bit. On the upside, The Kazakh people are very proud of their heritage and love to show off. They are generally happy to pose for you in full regalia or may even let you hold their eagle. Even being a shy photographer I got some great photos because the people were so happy to pose! Once the festival starts be sure to get out of the roped area. The event isn’t well equipped to tell all the foreigners to get off the field in different languages. For a while we heard what sounded like angry announcements in Kazakh until someone in English explained for everyone to exit. Even then many clueless people hung out despite being the only non-hunters on the field. “Will the man in the grey hat please exit the arena. The man in the grey hat. The man in the grey hat and the black sweater please exit the arena. WILL THE MAN IN THE GREY HAT AND BLACK SWEATER NEXT TO THE HUNTERS PLEASE EXIT THE ARENA.” This went on for several minutes until someone physically went over to tell them to move. The first event is a calling event. There are three circles on the field for different points. The eagle is taken to the top of the mountain and the hunter calls it down to land on his arm. The farther away the hunter is the more points he can get. There were about 90 hunters at the event I attended. Some eagles impressively went right to their hunters. Other eagles got lost or just never came down in the first place. Sometimes there would be three eagles flying around and two would try to land on the hunter in confusion. Many eagles struggle with the sounds and colours of the crowd. If you attend, try to wear muted colours and not be overly noisy so the hunters can be successful. The hunters who successfully call their eagle down will move on to the next round on the second day. An eagle hunter in action. 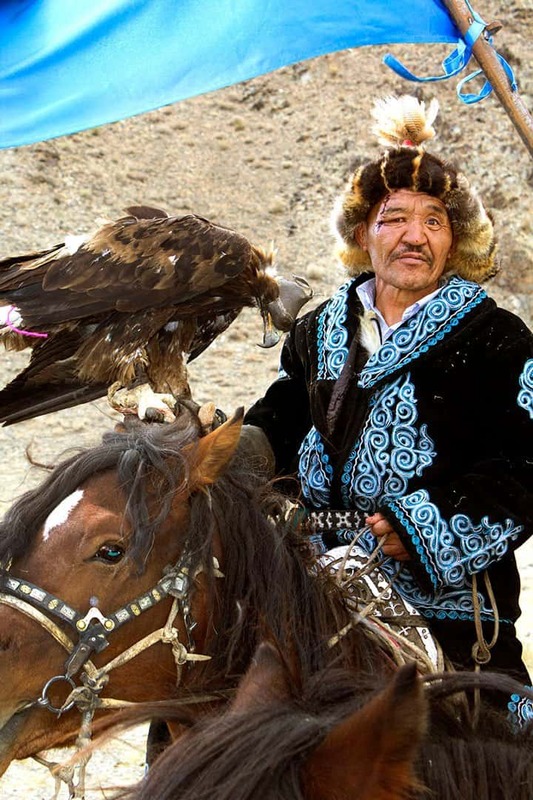 The second day’s event is calling the eagle from the mountain with a fox or rabbit fur that is tied behind the horse. I had better luck getting photos at this event as the hunters ride around trying to attract the eagle’s attention so you have a better chance of them coming close to you. Other events include archery, camel race, and Bushkashi, which is a tug of war game with a goatskin. This game gets very competitive and even sometimes results in fights! In addition to watching these events you can also buy some items from sellers. The most popular item is the hand-embroidery. 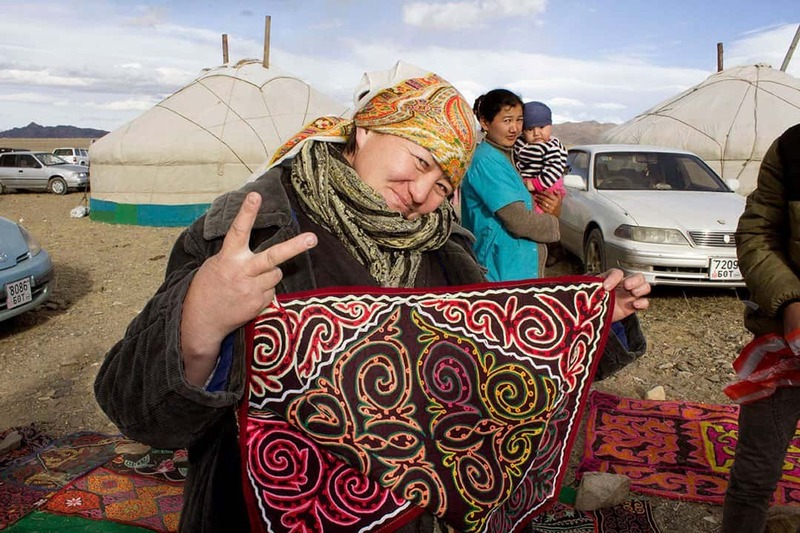 Kazakh women spend months embroidering tapestries that hang in the walls of their gers. Many of the older ones are sold at events like this. Most of the tapestries have circular or diamond patterns while others will have animals. All of them have an unfinished edge that symbolises that life never ends. I had a hard time choosing but found one in my price range for 180,000 Tugrik (about US$72). They threw in a purse and small patch of embroidery as thanks. You can also find wool felted rugs and beautiful traditional Kazakh coats. If I had more room in my backpack, I might have been in trouble. A local lady and her tapestry. As for food, don’t expect food trucks! Our guides had meals ready for us that they cooked in the van, but your only other choice for food is buying from someone selling out the back of their car. It will mostly likely be cold horse meat that is traditional for the area. I would also consider bringing some small snacks for emergency. Bathrooms at this event are virtually non-existent. There was one spot where a pit was dug with wood planks fitted over as a squatter outhouse. Tarps made walls on three sides but the one side is open so anybody walking by can see you. It’s general etiquette to glaze your eyes over while walking by so you’re not looking too intently at someone doing their business. If the tarp toilet isn’t for you, your only other choice is to just walk out far enough in the rocky distance and do your business there. This is what a majority of people did. If you have the opportunity, visit an eagle hunter’s home. Their gers are different from typical Mongolian gers and are very ornate on the inside. 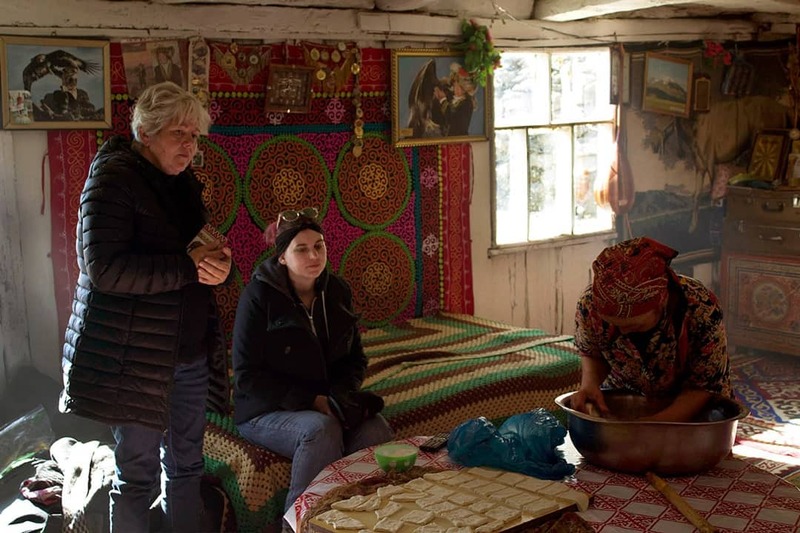 During the festival many of the nomads are switching from their summer homes to winter homes, which tend to be a wooden structure instead of gers. We were lucky enough to visit Aisholpan’s home, the young eagle huntress now famous for being featured in the documentary The Eagle Huntress. We were also lucky that Asher Svidensky, the photographer who first brought attention to her stopped by with his own tour. Through him we learned a lot about her family and the film. Although she was at school while we visited her parents were very welcoming and her father even dressed in his hunter’s costume for a photo! If you visit a home, it is respectful to bring a gift for your host. A nice food item or something useful like headlamps or stationary is appreciated. 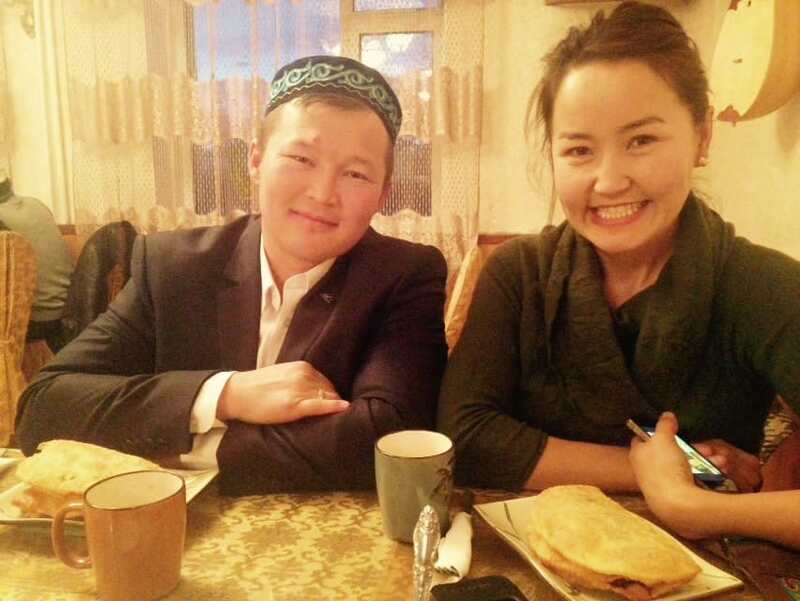 Sometimes beer or vodka is given but many Kazakhs are Muslim and do not drink alcohol. In addition to the festival our hosts brought us to the theatre for a show of traditional music and dance. This is a great opportunity to see traditional Kazakh costume. There is a small museum in town that is worth a look. We were also lucky enough to be invited to a wedding. 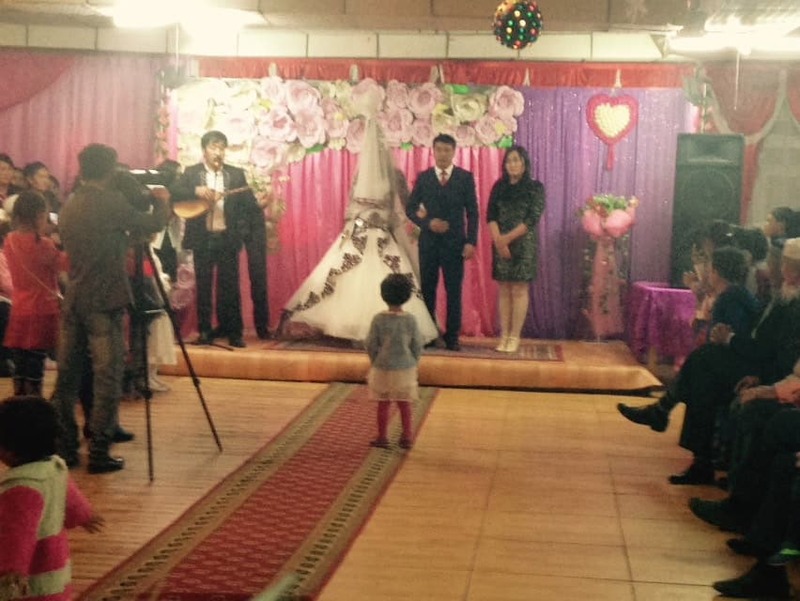 The wedding had about 500 people squeezed into a room with very little seating. During the ceremony kids ran wild while the grandmothers occasionally smacked them with canes. Afterwards we were served a grand meal with cakes, fruit, vodka, and airag, the fermented mare’s milk. It was quite an experience! For an introvert, staying with a host family may be an emotionally challenging thing. You should know that Mongolia is one of the friendliest countries I have ever been to and hosting is a deep part of their culture. So don’t dwell on feeling like an intrusion! Hosting is an honour for them. Be gracious, bring a gift, and toast airag to your new Mongolian friends! I'm Kori and I'm an adventurous introvert. I took my first overseas trip with my high school art club and was infected with the travel bug. Last year I moved to China to teach English and now travel every chance I get. I'm by no means an expert but am happy to share my embarrassing stories for your benefit.